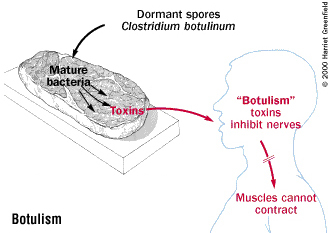 Botulism is a form of poisoning caused by exposure to Clostridium botulinum bacteria. These bacteria manufacture a chemical poison known as botulinum toxin that interferes with muscle function in many areas of the body, causing paralysis of individual muscles or groups of muscles. Exposure to this toxin is life threatening, since one of the muscles it can paralyze is the diaphragm, the muscle that controls breathing. You can be exposed to the bacteria causing botulism in several ways, the most familiar being by eating contaminated food. In most food-borne cases of botulism in adults, home-canned foods are responsible. The bacteria that cause botulism exist in dirt and dust as a spore, but this form is inactive and does not produce toxin. When a spore is moved into a low-oxygen environment, however, such as an enclosed jar or can, it can reproduce and make its dangerous toxin.